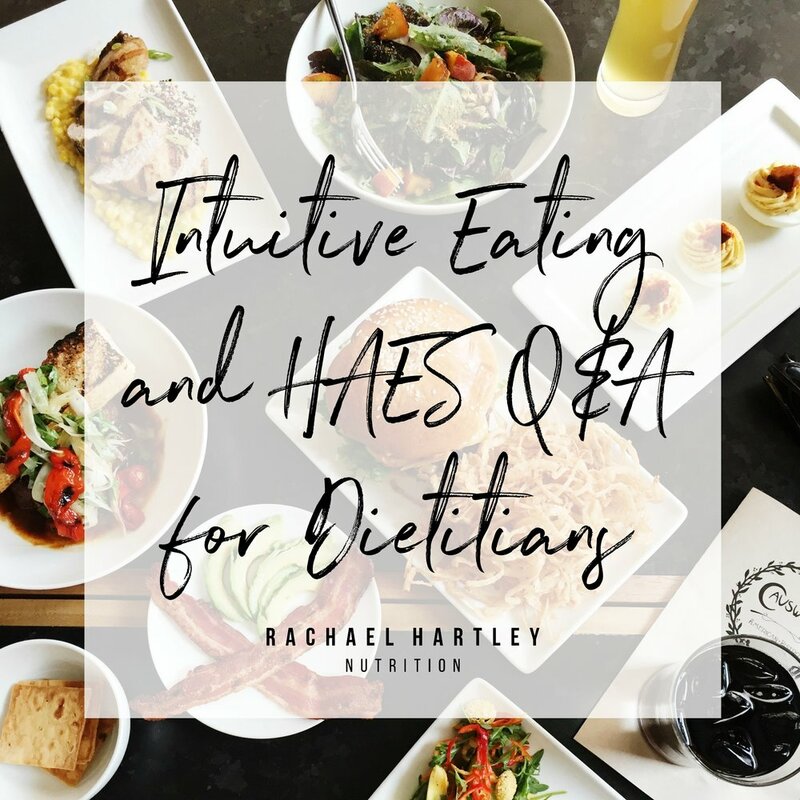 Yesterday on insta-stories I ask my dietitian followers to share their burning questions about how to use intuitive eating and HAES (Health at Every Size) principles in their practice and got some awesome questions that I'll be answering in a minute. But first, I wanted to share a bit about the Fall RD Entrepreneur Symposium (affiliate link). I led a seminar in the first RD Entrepreneur Symposium last year, and attended it as well. It was such a wealth of knowledge, even for me, as someone whose been at this three years. So I'm thrilled to participate in another round! The Fall RD Entrepreneur Symposium is a 3-day online event from 9/26-29, packed with seminars from 16 leading dietitians. We'll cover all the topics new private practice RDs are most interested in - maintaining multiple streams of revenue, podcasting, virtual private practice, accepting insurance, increasing referrals and MORE. The full lineup is on the site. I'm leading a seminar on how to use a coaching model vs. education in your practice, and focusing on how that helps you increase repeat clientele. 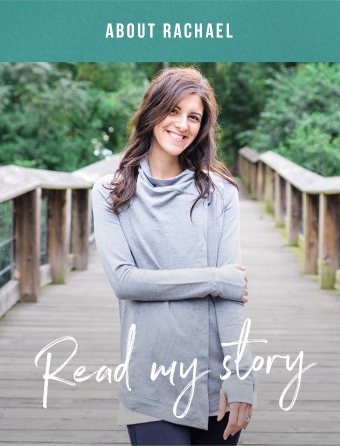 For me, coming from an outpatient hospital background, it was a game changer dropping the expectations of going over ALL things nutrition in one session, and instead learning to coach my clients to make behavior change. When I first started out, I jumped straight into private practice (I do not recommend this). So naturally, I learned a lot through failure. The only book I had was really dry and boring, and even though it did a good job going through the logistics, it was super old school and didn't really prepare me for building a business in the modern world for RDs. But the dietitians presenting in this symposium are inspiring, talented, GENIUS and really working at the cutting edge of dietetics. For the next 48 hours through 9 am on 9/9 use the coupon code FLASH to save $90. Click here to sign up! Is there a structure you use to guide your clients through the intuitive eating process? Not necessarily. Each client is so individual with where they struggle in their relationship with food and eating habits, disordered/restricting mechanisms, lifestyle, barriers, and of course, what they're ready to work on. It's really important to individualize work to focus on what's going to be most helpful for a client, and also what they're ready to work on. That said, one of the first things I usually work on with clients is the hunger/fullness scale and taking a look at their usual eating habits to ensure they're not getting overly hungry. I find the hunger/fullness scale helps give clients a sense of structure and security early on. And because hunger can drive many unwanted eating behaviors, preventing it can act like a windshield wiper to see what else is going on. If someone contacts you for weight loss, how do you present intuitive eating and HAES and keep them on board? This was the million dollar question. I literally had seven people ask me some variation of this! One of the reasons I do a free 15 minute phone call with potential new clients, even though it's time consuming, is because I want to make sure a client is on board with a non-diet approach before we start. That doesn't mean all my clients drop their weight concerns after 15 minutes of chatting (wish it was that easy!) but that they understand that my purpose is supporting their best health, not their weight loss goals. When I have a 15 minute call with a client, I always start by asking them what's motivating them to seek out nutrition counseling. This way, I know a little bit about a clients goals and can connect intuitive eating/HAES to their experiences. "Selling" intuitive eating in a weight loss world really isn't as hard as you'd think because most people know from experience that diets don't work, they just may not know there's another way. So it really comes down to confirming your potential clients experience with data (i.e. 95-97% of diets fail), briefly sharing the dangers of dieting and why that's not the focus of your practice, and showing them there's another way. In your initial session, don't launch straight into intuitive eating principles. Spend some time getting to know your client, their goals, how they relate to food. Connect intuitive eating principles to what they're sharing. For example, if you have a client discussing their concern with overeating at dinner, you might bring in honoring your hunger and how not doing this during the day could lead to overconsumption at night. Remember, it's about tailoring IE to their needs. You have to be okay with the fact that sometimes a client just isn't ready for a non-diet approach. If someone calls wanting to do anything to lose weight, deeply entrenched in the diet mentality, then it might not be the right time. But at least you can be there to plant a seed. What do you say to clients who say they only enjoy unhealthy food? An integral part of intuitive eating is eating foods you enjoy rather than the foods you think you "should" eat. But what if someone says all the foods they like aren't "healthy"? First off, dieting and labeling food good/bad can change someone's perceptions of what it tastes like. In Mondays post, I mentioned a study that went more in depth with this. So in most cases, I find if you're not pushing and give your client space to rediscover their tastebuds when they're not so deeply entrenched in the diet mentality, they'll gradually start enjoying more nutrient rich foods, especially when they start to tie in how food makes them feel. Occasionally you might run into someone who is a really picky eater. Let them choose to experiment with new foods on their own timetable. When they're ready, be prepared with some ideas that incorporate fruits, vegetables, beans, etc into foods they already like or how to prepare them in a tasty way. Also, there may be plenty of nutrient-rich foods they actually do like, but think of as "unhealthy." I find this often living in the south, where people feel shame for enjoying rice and beans and vegetables cooked in bacon grease. Lastly, make sure you drop your own internal rules about what's healthy. If you're hoping with intuitive eating will turn your client into a kale-smoothie guzzling good fanatic, then it's time to do some internal work. Healthy eating is flexible eating, not "perfect" eating. Anyway, I hope this answered some of your questions and helps you use these very important principles in your practice! I hope you'll be able to join for the RD Fall Symposium. Again, if you'd like to sign up, click here.